A Curious Collection of Dates: Through the Year with Sherlock Holmes is unlike any Sherlockian reference book ever published. It defies a tidy classification. Is it an almanac? The dictionary defines an almanac as "an annual reference book of useful and interesting facts…" and a publication "containing a calendar for the coming year, the times of such events and phenomena as anniversaries… and other statistical information and topics." Is it an encyclopedia? An encyclopedia is defined as a reference book "covering all branches of knowledge?" The answer? It is both, and more. Leah Guinn and Jamie N. Mahoney have assembled the most staggering array of research, commentary, and obscure facts ever assembled in one Holmesian volume. It's been said that Sherlockian studies is a gateway to life-long learning, and here's the proof! Every day of the year is highlighted with significant events from every area of the Sherlockian Universe, both Canonical and historical. Curious about what curious incident occurred on your birthday? It's here. Ever wonder what Canonical event your scion society can celebrate at its next meeting? The answer's inside. Have a guess about the most significant event to happen today in Holmesian history? Look it up! 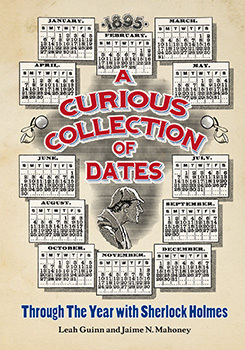 A Curious Collection of Dates: Through the Year with Sherlock Holmes is endlessly fascinating. Whether you read it from beginning to end, or sample at random specific days or months, you will be entertained and astounded at the sheer range of subjects that belong under the convex lens of Sherlockian interest!